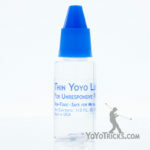 Learn how and when to use Thin Yoyo Lube to protect and maintain bearings during unresponsive play. In this video I am going to talk about how to use thin yoyo lube to prolong the life of your bearing. We have got another video about using thick yoyo lube to help your yoyo play more responsive, so check that out. Like I said, with thin lube the purpose of thin lube is to maintain your bearing. To keep it from wearing out, to keep it from rusting, while at the same time allowing it play unresponsive. So in this video the first thing I want to do is to address some myths that have come up about thin lube. Then I want to help you know when the best time and how often to lube your bearing is, and then finally I am going to give you a method for lubing your bearing that seems to work really well and help your yoyo play as good as it can. So like I said. There are a couple of myths that come up around thin lube, as funny as that may sound, that whenever people use thin lube and they don’t really know what it’s for they end up being disappointed with the result, so let me address those. The first one is that a lot of players think that the purpose of thin lube is to help their yoyos spin longer, and in fact this isn’t the case. 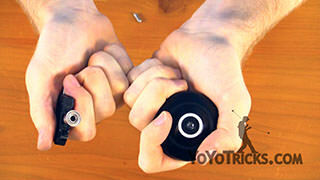 When used properly, thin yoyo lube will keep the yoyo spinning just as long as it did before. It won’t help or hurt your spin time. Though what happens a lot of times is players who think this will get a yoyo and it’s brand new and it doesn’t have any lube in it so they will throw and they’ll see how long it sleeps. Then they’ll put some lube in and they’ll throw it again and it’s pretty much the same and so then they will put a lot of lube in it thinking that will help. Then strangely enough, their yoyo doesn’t spin as long and in fact it might even make the yoyo start to play a little bit responsive which can be really irritating if you are getting an unresponsive yoyo. That is in fact what will happen if you put in too much thin lube, it will start to flood the bearing and it will start to decrease spin time and it will make your yoyo play a little bit responsive. Now I think that actually gave rise to the second myth which is that if you talk to some yoyo players who have been yoyoing for a really long time they’ll actually tell you that using thin lube on your bearings is a bad idea. I think this myth goes back to the early days of unresponsive yoyoing where players didn’t really know exactly the best way to lube their bearings and they weren’t sure how just everything worked together so again in a lot of cases, bearings were getting over lubed and those types of things were happening where bearings didn’t sleep as long, they start to become a little bit responsive, and so a lot of players just gave up. They basically said, you know we are just not ever going to use this we are just going to play with the bearings dry. Now the reason you don’t want to do that is because if you play with your bearing dry it is going to wear out really really fast. Sometimes I’ve had bearings that have worn out in just one week because I didn’t lube them. Most cases I think bearings will last about a month and they’ll completely wear out and they will need to be replaced. But if you lube your bearings properly with thin lube, then not only is it going to sleep just as well as they did before but they are going to last a lot longer and I mean a lot longer. 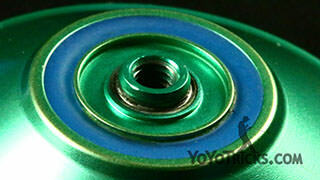 Months and months and in most cases the bearing will last the whole life of the yoyo. That will really save you a lot of money because one bottle of our thin lube the YoyoTricks.com Thin Yoyo Lube costs less then just about any decent bearing that’s on the market. If that can keep your bearings playing a lot longer, so it’s going to add up over time so it’s a good idea to do that. The other thing that’s nice about our lube is if you do happen to over lube your bearing and it starts to play responsive. 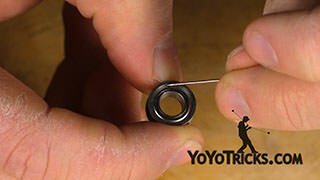 YoYoTricks.com Thin Yoyo Lube actually kind of thins itself out and will allow the yoyo to play unresponsive again. So if you lube your bearing and it is starting to play responsive and you don’t want that, just play with it for a good five or ten minutes and eventually you will see the yoyo starts to play unresponsive the way that it should. The next thing is how often and when should you lube your bearing? So this what I do, whenever I get a new yoyo I’ll usually play with it for five or ten minutes just to see how it plays and how things go. Then I’ll take the yoyo apart and I’ll lube the bearing almost right away. Then you don’t really need to lube your bearing again until it starts to make noise, usually it’s like a louder noise or maybe the pitch of the bearing or the sound that it’s making will change a little bit. Usually when that happens, it will start to feel a little bit gritty, even the sound of it sounds a little bit gritty, if you don’t lube your bearing when those changes start to happen, then your spin times will quickly start to diminish. Your bearing will start to become responsive and it will need to be replaced. But as soon as you start hearing those sounds if you lube the bearing the way that I show you, in just about every case that’s going to make the bearing go right back to playing just about well as it did as when it was brand new. It will really save your bearing and, again, you will be able to use it for a very long time. Now there is one other time where you are going to want to lube the bearing that might not be so intuitive. That’s when you have a responsive yoyo that actually plays as responsive as you want it to play without any lube at all. There are two yoyos that I was thinking of when I was thinking about this and the first one is the Unleashed and the other one is the F.A.S.T. 201. Both of those yoyos have such an aggressive response system that even with out lube they play just as responsive as you like. So a better idea than using thick lube when normally playing with a responsive yoyo is to just lube those bearings with thin lube and those bearings will spin as long as they always did when they were dry but they won’t wear out in the same way. So that is just something to keep in mind. So like I said next I am just going to show you a good method for lubing your yoyos, it’s pretty easy, that way it will keep them working properly and will help you maintain those bearings. So as you can see you got your yoyo with your bearing that needs to be lubed. You can see this one has a couple of dings in it because I have been using this yoyo for a while so it is a good time to lube the bearing. I also got my thin yoyo lube and as you can see, the thin lube, its got a fine point applicator on it and so that makes it a lot easier to get a very small amount of lube in your bearing which is important, especially for thin lube. I also got a sheet of paper here which is just to soak up any excess lube. So of course you want to take the yoyo apart. I am going to set that string off to the side, we might use that later. Then if the bearing is stuck on there a little bit tight you can always use your multitool to get that bearing out, as you can see that comes right off. Then I am going to put that bearing on the piece of paper and just put the yoyo off to the side. Get out our thin lube. What I do is I turn the bottle over and what when I do that lube starts to come out a little tiny bit and you can actually see a little bit of lube pooling right under the tip of the lube bottle and so if I touch it to the paper you can see a really small amount has come out. What I usually do is just give it a little bit of a squeeze until about half of a drop has come out and what I mean by that is that a full drop would actually drip right off the tip of the bearing. You don’t want that much lube you want less than that. About a half a drop maybe even less than that it doesn’t take much to lube your bearing. So once you got the right amount you can touch to the shield of the bearing if your bearing has shields. If it doesn’t, if you got a shieldless bearing you can just touch this to one or two of the balls and that will kind of do the job. When you do that you probably can’t see it in the video, but the lube actually pooled around about halfway around the bearing before it all sinks in. If that’s the case that’s exactly the right amount of lube. Sometimes when you do it, it will pool all the way around, that’s a little more than you need, but like we said if you use the yoyo that lube will thin out. So what I do after is I just flip the bearing over and I rub it on the paper. Since the paper is not super absorbent it’s going to take away any excess lube that’s on the surface but it’s not going to pull any out of the bearing. Then I do the same thing on the other side, about a half a drop touch it on the bearing you can see it pool a little bit flip it over and just move it over the paper to dry it off. Now if you got any lube on the outside of the bearing or just anywhere where you don’t want it you can always use like a towel or paper towel or something like that to get the extra lube off. Sometimes I don’t feel like getting up, I’ll just take my yoyo string that’s old and just kind of get all that extra lube off the bearing, you can do whatever you want. But really that’s it, it’s that simple and then you’re just going to take the bearing back in your yoyo and put it back together and you are good to go.